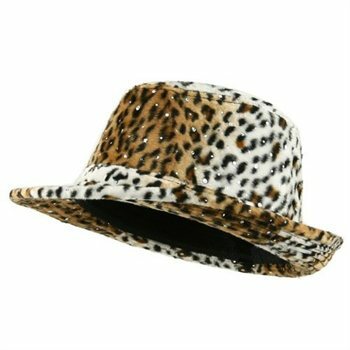 For the people with a wild side, the Leopard Animal Print Sequin Fedora Hat in leopard will surely compliment them. Have fun accessorizing with this lovely leopard print fedora hat. This glamorous hat is designed to keep your head warm and well-protected. Leopard prints are famous for being worn by only the sexiest people. With this appealing hat, exude your sexiness! This item offers a full inner lining for comfortable fit. The exterior is incredibly soft and looks like genuine leopard fur. With an adjustable strap closure in the back, this hat will fit most heads comfortably. So tame that animal side with the Animal Print Sequin Fedora Hat. Made of 100% polyester. One size fitting up to 7 1/4. Crown measures 4 inches deep, Brim measures 2 inches wide. Thick, stiff and warm material. Hand wash only. Available in brown and leopard. Imported.